You may think OCBD stands for obsessive compulsive behavioural disorder, not so. To the fan of traditional clothing, it is shorthand for a backbone of his wardrobe: the oxford cloth button down shirt. Yesterday was perfect. It was hovering around 70ºF with no humidity. My virus ravaged stomach was on the mend and my final paper for my history class was well underway when I took the dog for a walk. Still, after days of discomfort, I wanted clothing that was as familiar and easy to wear as my pyjamas. Slipping my Oxxford sportcoat over my OCBD and blue gabardine trousers, I felt relaxed and comfortable. The light breeze swept through the open weave and (in combination with the Gold Bond Body Powder) kept me dry. Oxford cloth, with which you are very familiar, is a cotton cloth woven in a basket, or Oxford weave. (One over, one under. To get blue cloth, the warp –the twin cotton threads running the full length of the loom – is white, while the weft — the thicker single fiber woven across the warp — is blue.) It is a bit heavier than most dress shirtings and considered more casual, although the weave is open and allows for air to circulate very nicely. Pinpoint Oxford is a finer weave and less beefy, making it preferable for “dressier” applications. The button down part was “invented” (reproduced) by Brooks Brothers as a variation on the shirts worn by polo players who had their collars buttoned down to stop them from flapping about while at a gallop. 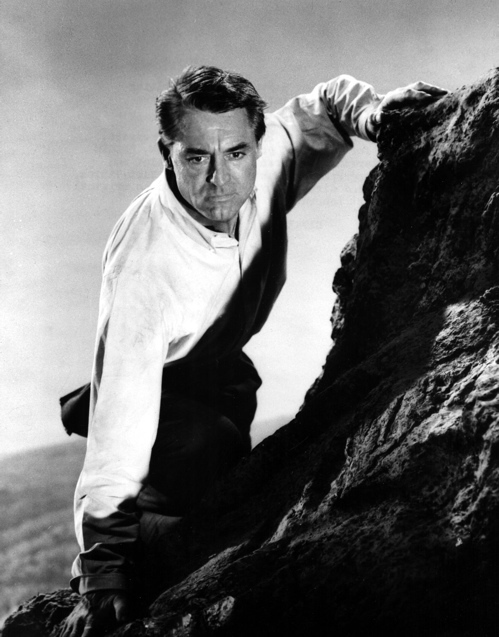 Cary Grant’s shirt, worn in the photo above, probably came from that bastion of traditional clothing: Brooks Brothers (a personal favourite of CG’s), and while I find that their quality isn’t what it used to be (whose is? ), they are still a classic. Nobody does the perfectly insouciant collar roll better than BSquared, and the pink OCBD is unbeatable. Gianni Agnelli wore his with the collar buttons undone. Today, you may find just about every label making a button down. I find that Land’s End Hyde Park model to be very well constructed with hardy buttons that will outlast the worst the cleaners can inflict. And if you are a fan of a more tailored fit, they will custom make them for you. At $35, it is an outstanding bargain. The nice thing about an OCBD is that it gets better with age, more comfortable, while still holding a firm pressing with great tenacity. I chose to wear one for the overnight stays in the hospital when both of my children were born. Even after sleeping in them, I remained fairly presentable for the pictures. If you choose to starch your shirts (not recommended for the longevity of the garment), the OCBD will not disappoint. It is military in its crispness. Which is probably why oxford cloth was used in the making of cotton uniforms. So this weekend, when you’re wondering what to wear with your flannels, khakis, jeans, shorts or swimsuit, reach for your OCBD, roll up the sleeves, chuck a blazer into the back of the Wagoneer and head for the park — or scale Mt. Rushmore. You’ll be ready for anything. This entry was posted in Elegantology and tagged clothing, Elegantology, sportswear, traditional clothing. Bookmark the permalink. This makes me think of Father’s Day. Both the shirt & seeing CG as he was the leading man in many a movie I watched with my father. Any chance you’ll tell us about some of your favorite Father’s Day gifts? The hubby dog-eared a page of the Orvis catalog in case I needed inspiration. Or just in case I wanted to get it right. Would love to hear any ideas you might have. For both my dad & my beau. They’re both the tops. Hello Mc, Happy Memorial Day weekend. Thanks for the kind words and I’m glad that the post resonated with you. What great memories! I’ll do my best to put together a Father’s Day list and post it next week. Hopefully that’ll give you time, but it sounds like your husband has it covered!